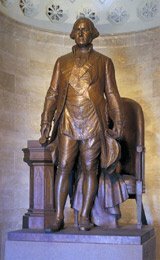 Suffolk Masonic District - Long Island, NY: Masonic Sites in Washington D.C. This is the tallest building in this part of the Washington DC area, rising 9 large stories above old town Alexandria. It is right next to the King Street Metro station.The Memorial contains lodge rooms, a gift shop, exhibits about George Washington and Freemasonry, a museum, a large Masonic library, and such items as George Washington's family Bible, locks of his hair, and items used during his funeral. There is also a Replica Lodge room that is furnished as a lodge room would have been during Washington's lifetime, with additional exhibits including the trowel he used when laying the cornerstone of the U.S. Capitol building, and the clock that was in his bedroom when he died. Meetings of Lodges and other Masonic groups are held in the Memorial regularly. The House of the Temple is an office building for the Sovereign Grand Commander and other officers and staff of the Scottish Rite, Southern Jurisdiction of the United Stated (Mother Council of the World). It also has many museum rooms and a large Masonic library.Biennial meetings of the Scottish Rite, Southern Jurisdiction, are usually held in the House of the Temple. There are many Masonic references in the Capitol, but some are not too clear or easily found, such as square and compasses in some paintings. Some architectural historians, though, have written extensively about the entire Capitol being a Masonic structure, with Masonic symbolism evident in many places and ways. This building is primarily an office for the Grand Master, Grand Secretary, and staff of the Grand Lodge.It does not have any lodge rooms, but some informal committee meetings are held here. The Prince Hall headquarters building is a large structure that includes offices for the Grand Master and other officers and staff of the Grand Lodge, plus the officers and staff of other Prince Hall Masonic groups in Washington, D.C., such as Eastern Star, Royal Arch, etc. It also contains lodge rooms, and other rooms large enough to hold Grand Lodge sessions and banquets. Next to the Grand Lodge building is a Monument and Memorial to the African American soldiers who fought to save the Union during the Civil War. Abraham Lincoln and others said that without the assistance of these men, who were called the U.S. "Colored" Troops, the Union might have lost the Civil War. There is also a museum in part of the Grand Lodge building, next to the Civil War memorial, that contains exhibits about the Civil War and the role of African Americans in it. The D.C. Scottish Rite building is separate from the House of the Temple, which is the headquarters for the entire Scottish Rite, Southern Jurisdiction. The two buildings are located just a few blocks from each other, both being on 16th Street.The D.C. Scottish Rite building contains a large auditorium, where the D.C. Grand Lodge and other bodies hold their meetings, and where the D.C. Scottish Rite confers its degrees. It is also the usual location for conferrals of the 33rd degree.This building also contains offices for the D.C. Scottish Rite officers and staff, and a lodge room where the Scottish Rite bodies meet -- every week on Tuesday at 7:30pm. This Shrine building is located in the business area of Washington, D.C. It houses offices for the Potentate, Recorder, and other officers of Almas Shrine. It also contains an auditorium and smaller rooms where the Shrine and some of its groups hold meetings. There is also a room with a bar, and a room that is used to serve meals. Congressional Cemetery where Brothers J. Edgar Hoover and John Philip Sousa are buried. Externally the Women's Museum of Art still retains the Masonic symbols of its earlier owners (Grand Lodge of D.C.), it must have been a beautiful decorated structure internally.